Dateline November 28th, 2018 1:33 pm. — Let me set the stage. I am in a lovely high-rise condo on the fifth floor. The client has called me for a duct cleaning quote. Our very happy camper at this point begins to tell me how he has just bought the unit and is so excited to be moving in. The one thing he cannot have in the unit is any type of mold, you see he had been very ill in the past due to a mold issue in his previous home so that is why he needed the duct work to be cleaned before he moved in. Further painting the picture for you my intrepid reader, all the walls are freshly painted in different shades of blue; the flooring has been entirely redone with a tile that very much appears to be hardwood. The kitchen is just stunning with these light gray cabinets, all stainless steel appliances and he is just waiting on the countertops which will arrive this week. The ceilings are freshly painted bright white and a stunning chandelier has been hung just waiting on the dining room to be filled with love and laughter. Okay, got it? I begin my inspection process of the duct system only to find it is made of a type of material that unfortunately cannot be cleaned.Further into my inspection I discover an air conditioner that is 15 years old and so rusted that I was afraid to even breathe on it for fear it would break.The topper on the cake was the water heater that was at the ripe old age of 23. The heartbreak began when I took a couple of the supply vents down to find that the duct system was just pure black inside from biological growth. I explain to our now less happy camper that in this case the only repair is going to be to replace the duct system. Remember, I said I was in a condo, right? Well that means to replace the duct system quite a few holes are going to need to be cut in the freshly painted walls and ceilings. Next, I explain to our new home owner what will happen if that 23-year old water heater tank were to burst and about how much water he would be sending down to the four floors below him. It was a fifty gallon tank which by itself isn’t so bad, the problem is the 5 gallons or so additional water you are going to get per second until the water is turned off. If no one was home when the heater failed and say it took just fifteen minutes for someone to realize what was happening and stop it you are now somewhere around 5,000 gallons of water. Think that insurance claim would hurt? On to the air conditioner, it had to be replaced. It was so rusted out in spots that it was sure to cause water damage in a very short period of time and the likelihood of it cooling his new home to his satisfaction was slim to none and slim had just left the building. This is when I posed the question, did you have a home inspection before you bought the unit? He said I did and he didn’t tell me any of this. I’m thinking well it’s time to rip the band-aid off. Well Sir (I said in my most compassionate voice) unfortunately you have fallen victim to an incompetent inspector who missed some of the biggest things in your home. If you want this home to be safe and healthy you are going to need to undergo a rather intensive construction project that is not only going to delay you moving in, much of the cosmetic work you have done is going to need to be redone and this is a project that will be in the five figure range. 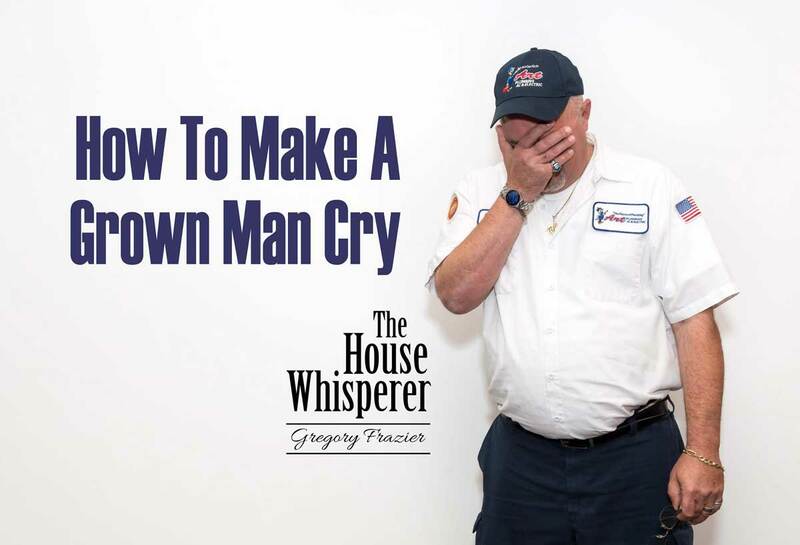 Enter the grown man crying. The moral to today’s story is that many so called home inspectors are not good at what they do, or they just scratch the surface of the house and often miss crucial things that can cost a new home owner big money. My other personal gripe with a lot of home inspection services is they know a little bit about everything and many times do not know a lot about one thing. My advice to you is if you are thinking of buying a home call a company that specializes in fixing things and not just inspecting them, we will see things that inspectors won’t. I really felt bad for our homeowner in this case because at the end of the day he was so upset that he was putting the unit back on the market and said it could become someone else problem. If you want to talk about a shattered dream this was it and all because someone didn’t do their job. My faithful readers know I usually go out on a pun or a silly one-liner however today I’m just going let this story sink in.